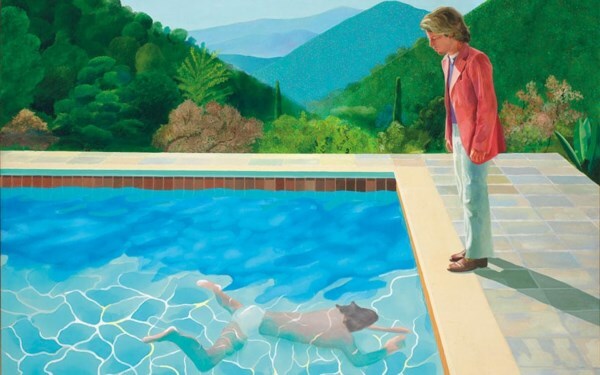 David Hockney is the world’s most expensive living artist as of Thursday night, when “Portrait of an Artist (Pool with Two Figures),” his big, color-soaked picture from 1972, sold at Christie’s New York for $90.3 million. It’s a dubious distinction, given that the eighty-one-year-old British painter won’t see a cent of the proceeds. In the U.S., artists aren’t entitled to royalties when a piece changes hands; they profit only the first time their work sells. The Hockney record topples Jeff Koons, whose balloon dogs sold, also at Christie’s, for a measly $58.4 million, in 2013. The painter, never press-shy, has issued no comment on the astronomical payout. (The identity of the buyer, as ever at auction, remains unknown.) Last week, at an event in his honor in London, Hockney did share his thoughts on the pre-auction hoopla with Reuters, saying, “I ignore it.” Still, it’s bound to feel good—vindicating, even—for the L.A.-based painter, whose exuberant figuration was, until recently, considered the visual equivalent of easy-listening music by the art-world intelligentsia. The market is a shallows, reflecting art as an unregulated and increasingly obscenely priced financial instrument; the real value of a great painting has an unquantifiable depth. I just hope that Hockney’s beautiful picture is bound for a wall and not a crate in a freeport.